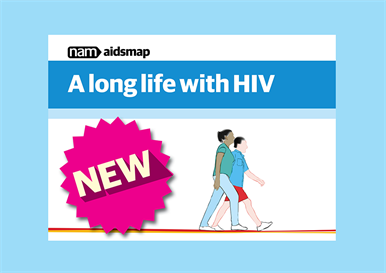 We have produced a new booklet that provides information on living well with HIV as you get older. A long life with HIV is available to read online, and in print through our patient information scheme. More and more people living with HIV are now in their fifties, sixties or beyond. With the right treatment and care, most people with HIV can expect to have a near-normal life span. Many people have concerns about getting older with HIV. A long life with HIV focuses on the practical things that people can do for themselves to look after their own health. The booklet also provides information on health issues which may arise when living with HIV long term. This information can often be overwhelming but it’s been broken down into small sections. We’ve also included lots of illustrations throughout the booklet to help make it more accessible as well as visually appealing. The booklet is not intended to replace discussions with medical teams – in fact, it should help you to engage with your doctor or healthcare providers about your health care. HIV and your health: life expectancy for people with HIV, HIV and the ageing process, tailoring your treatment and multiple medications and drug interactions. Other health issues: monitoring your health, and health conditions including raised lipids, high blood pressure, diabetes, bone problems and menopause. Things you can do to look after your health: taking HIV treatment, stopping smoking and getting more physical activity. Preparing for the future: work and employment, putting your affairs in order and learning how to manage multiple healthcare providers. Each chapter also includes a ‘Find out more’ section, signposting to further information by NAM or other organisations. Factsheets: 24 titles including HIV and the ageing process, Life expectancy for people living with HIV, Multiple medications and drug interactions and Dealing with multiple healthcare providers. Side-effects checker: a tool to help you talk to your healthcare team about any side-effects or symptoms that you are experiencing. Side-effects: a booklet that provides information about possible side-effects of HIV treatment. Translations: a selection of factsheets translated into Greek, Spanish and Portuguese. UK-based HIV and GUM clinics can order copies of A long life with HIV and Side-effects as well as all our other booklets and leaflets in our series The basics, through our online portal as part of our patient information subscription scheme. NAM is grateful to Gilead Sciences Europe Ltd, Janssen-Cilag Ltd, Merck Sharp & Dohme Corp and ViiV Healthcare for funding the development of A long life with HIV and other resources in the Living with HIV as you get older project. Our funders have had no editorial control over the content.